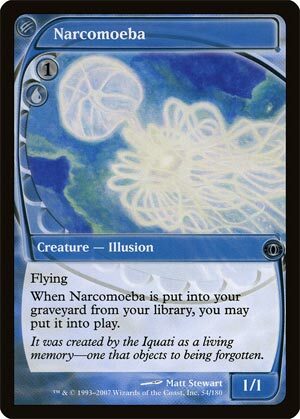 You can certainly use Narcomoeba as an early, evasive creature. Illusions have been a relevant tribe ever since M12 gave us Lord of the Unreal and his entourage of phantasmal creatures, and it can carry something like a Loxodon Warhammer reasonably well. It doesn’t attack quite as well as something like Vaporkin, but it’s passable. The real payoff, of course, is getting to put it into play when it gets milled out of your library. It’s still not stellar as a defense against being milled, but its combo potential has been well established ever since its time travel-assisted debut in the same block as Dread Return. I’m not sure we’ll get to experience that in Standard again any time soon, but it was clearly planted in Guilds of Ravnica to interact with surveil, and I suspect we’ll find that a lot of spells become better when you add a 1/1 flying creature to their effect for absolutely free. It may be a throwback, but Narcomoeba is highly relevant, as it is making its triumphant return to Standard after 10 years in Guilds of Ravnica. We may not have seen it with the Iquati, but it has a nice home in Ravnica all the same. 2 mana for a 1/1 flier is not a great rate of return anymore, but zero mana is certainly a fair price! Narcomoeba has synergized well with dredge and other self-mill mechanics over the years, as free flying creatures is legit. And with surveil, it has a new friend to play with, as surveil moves the Narcomoeba from your library to the graveyard. While Narcomoeba is a rare, it’s still a potent little combo piece. And a free 1/1 flier is rarely, if ever, a bad thing.